Area: 38916 sq km. Location: Quttinirpaaq National Park is located on the northern tip of Ellesmere Island in the Canadian Arctic. Terrain: Quttinirpaaq ("Top of the world") covers the most remote, rugged, and northerly lands in North America. Icefields up to 1,000 m thick still cloak the mountains of Grant Land in the northern portion of the park. This ice is a remnant of the last ice age that covered most of North America 10,000 years ago. Several nunataks protrude through the icecap, the highest being Mount Barbeau at 2616 m, the highest peak in Nunavut. The ocean coastline of the park is deeply incised by glacial valleys and fjords. To the north, where the mountains of Grant Land meet the ocean, unique shelves of sea ice as much as 80 m thick have held fast to the shore for thousands of years. South and east of the mountains, the land abruptly descends to Lake Hazen, 80 km long and with a surface area of 542 square kilometers. The headwaters of the Ruggles River, the sole outlet of Lake Hazen and its drainage basin does not freeze over even in the -60°C winter cold. The rugged Hazen Plateau gradually rises to the southeast of the lake. Dissected by river canyons, the plateau ends in the east at the 600 m cliffs of Archer Fjord and Robenson Channel. Quttinirpaaq is a polar desert, one of the driest areas of the northern hemisphere, with an annual precipitation of only 60 mm. In areas where ground water is retained, vegetation such as grass-sedge meadows flourish. Ground hugging willows grow wherever enough soil, nutrients, and moisture allow for their survival. Bright arctic wildflowers dot the landscape with yellow, white, pink and mauve. These plants in turn provide food for musk ox, Peary caribou and Arctic hares. Arctic wolves prey on the herbivores in the next turn of the ecological spiral. During the summer, thirty species of bird nest in the area. History: Quttinirpaaq was first visited by humans about 4000 years ago. They were Paleo-Eskimos, an ancient race of people who probably came across the Bering Strait from Siberia. Their campsites in the park, characterized by the box-shaped hearth, tell us that their numbers were low and that they only occupied the land for 300-400 years. They hunted musk ox and caribou and somehow survived the long, dark arctic winters. It appears no humans lived on Quttinirpaaq for many centuries afterward. A second wave of Paleo-Eskimos returned to the high arctic about 3000 years ago and migrated across the arctic islands and reached Quttinirpaaq. A third distinct culture, the Dorset culture, lived on Quttinirpaaq up until about 1000 years ago. They were in turn supplanted by the Thule people who were skillful hunters of whales and other marine mammals. While the Thule culture survived elsewhere and are the ancestors of the modern Inuit, they abandoned Quttinirpaaq when the climate turned colder leading up to the Little Ice Age of 1600-1850 AD. The first Europeans to arrive in the area in 1875-76 were part of a two-ship, British expedition led by Sir George Nares. Captain Stephenson of the HMS Discovery spent the winter at an outpost named Fort Conger on the northeastern coast of Ellesmere Island. The sister ship, HMS Alert, wintered further north. They man-hauled sledges to explore the north coast of Ellesmere Island and Greenland. From 1881 to 1883, American, Adolphus Greely, a lieutenant in the US Signal Corps, used Fort Conger to explore the interior of the island and to collect meteorological, auroral and magnetic data as part of the International Polar Year. Between 1898 and 1909, Robert Peary refitted the encampment and used it sporadically on his various attempts to reach the North Pole. In 1922 the Royal Canadian Mounted Police came to Ellesmere Island and established a post at Craig Harbour. Later two more posts were established, one at Bache Peninsula and the other at Alexandra Fiord. Their patrols were led by Inuit guides from northwest Greenland who took them across much of the island including the park area. 1957 was the International Geophysical Year and research bases were built all over the Arctic and Antarctic. One base was built on the north shore of Lake Hazen and was occupied from 1957 to 1959 by a research team led by G. Hattersley-Smith of the Canadian Defence Research Board. Today, research bases exist on Ward Hunt Island and Tanquary Fiord to study glacio-geomorphology, natural, as well as human history of the park area. 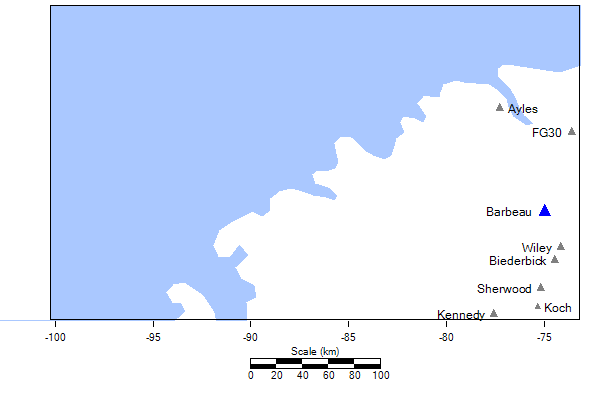 In 1988, a large area of northern Ellesmere Island was given protected status and formally named Ellesmere Island National Park Reserve. Its name was changed in 1999 to Quttinirpaaq.